Have you ever wished you could grow mangoes, coffee, oranges and other delicious tropical plants… but find yourself limited by a less-than-tropical climate? If you long for Key lime pies at Christmas, or homegrown bananas at breakfast, you’re not alone! Expert gardener and mad scientist David The Good fought for years to figure out how grow tropical plants hundreds of miles outside their natural climate range… and he succeeded! 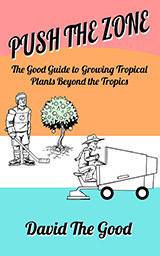 Featuring a foreword by Dr. David Francko, the author of PALMS WON’T GROW HERE AND OTHER MYTHS.